The CDOT system enhanced by an integration of TrafficVision™ video analytics for real-time incident detection and reporting to TMC operators through their advanced traffic management system (ATMS). In 2015 the Colorado Department of Transportation (CDOT) issued a request for proposals to the intelligent transportation systems (ITS) community for a proactive incident detection and data collection system that would leverage their existing highway CCTV cameras. TrafficVision was selected for award and is currently in the second year of a five-year contract. 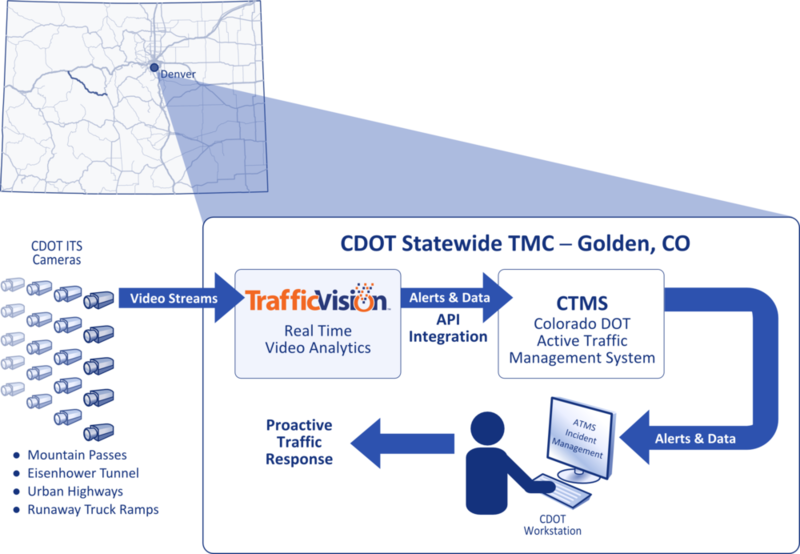 Like other states using TrafficVision, CDOT chose to invest in video analytics because they knew technology enhancing their existing infrastructure was the most efficient way to alleviate the effects of incidents throughout the state. TrafficVision’s patented computer-vision algorithms make for an easy and effective video analytics solution for traffic monitoring, even for pan-tilt-zoom cameras operating in all weather conditions. Incidents and congestion are problems for any state, and Colorado is no exception. According to a study conducted by Texas Transportation Institute, along with the safety hazards of traffic accidents, Denver metro area commuters experienced an average of 49 hours of delay and wasted 24 gallons of fuel in 2014 due to congestion. Other cities in the state experience incidents and congestion as well, along with incidents frequently occurring in rural areas and in the famous mountainous terrain that need to be detected immediately. Colorado is also known for its powerful and unpredictable weather patterns which can cause severe traffic accidents and delays. Managing traffic throughout the state of Colorado falls to the statewide traffic management center (TMC) in Golden, just west of Denver. Here, operators and dispatchers respond to calls and incidents to keep traffic moving freely and to minimize the effects of an incident on roadway safety and travel times. The hope in investing in a video analytics system was that it would proactively alert these operators to incidents in real time allowing them to dispatch the necessary response immediately. The estimated total number of CCTV cameras statewide will approach 500 over the coming years. The DOT believed it was impractical to expect operators to manually monitor all of these; however, they also realized that these previously-purchased devices could be made “smart” and turned into non-intrusive sensors, with TrafficVision video analytics monitoring these streams at the TMC. In 2015 the TrafficVision system was installed at the statewide TMC and was configured to monitor cameras in a variety of roadways throughout the state. These cameras were sending video back to Golden. TrafficVision software has been monitoring a mix of cameras on urban and rural highways for incidents outside of normal recurring conditions. Along with those, the software also monitors special application cameras such as runaway truck ramps along mountain passes. Cameras located inside the Eisenhower tunnel, approximately 60 miles in length under the Continental Divide of the Rocky Mountains west of Denver. Since installation, TrafficVision has been vigilantly monitoring these roadways twenty-four hours a day and has detected numerous incidents of note. To quantify return on investment, CDOT conducted a blind study to compare TrafficVision’s effectiveness at detecting incidents compared with their standard operating procedures, namely operators manually monitoring cameras or receiving phone calls from motorists. The findings were impressive: on average TrafficVision detected incidents 14 minutes faster than their operators and existing operating procedures. In situations where minutes have dramatic implications for roadway safety and traffic congestion, CDOT's decision to combine TrafficVision's non-intrusive detection with their existing CCTV cameras and video infrastructure proved to be well worth the investment. Colorado DOT has big plans for TrafficVision. Based on their internal study results and operators feedback, CDOT has submitted a grant application to expand their deployment so more cameras can be monitored in the coming years to help keep the roads in Colorado safe. Alerts about incidents as well as real-time data will be integrated into their advanced traffic management system for seamless reporting to the operator. TrafficVision video analytics detect a stopped vehicle on a snowy median. An incident notice is immediately pushed to the TMC operators. A stopped vehicle is detected at the base of a runaway truck ramp. TrafficVision detects a stopped vehicle in a tunnel. Fast incident notification can result in quick emergency response and prevent potential secondary accidents.